I'm not gonna sugar coat it: 2017 started off a little rocky. I had thoroughly exhausted my self in 2016 so I made the decision to cut back on advertising and not push my self so hard on social media. The consequence of that decision meant I had a slower season than expected. My initial thought was "this is great, I'll have time to devote to each client and maybe some time to start some projects!" But I definitely got to spend more time with clients this year. I ate dinner with clients. Our phone conversations were less business and more conversation. I really felt like I got to know them. I got to know their real desires for their wedding plans. I learned how photos fit into those goals and how I could contribute to what were great memories. My one hour sessions turned into two hour sessions. My workflow during portraits slowed down and I was able to be more conscious and controlled with each click of the shutter. I took less photos, as a result. I also got to spend more time playing around with Gifs. Since I had stepped back from social media, I would capture them and fail to show them off. So I decided to show off 2017 with all of the Gifs I captured through out the year. I hope you enjoy this slightly long video and the favorite portraits of 2017 to follow. Needless to say, Katherine & Kline were surrounded by people who loved them very much. They donned on their winter coats for a brisk November wedding day. Katherine & Kline kept everyone laughing through out the day. There was rap music to hype everyone for the first look, followed by the joyous introduction to Albee the dog, and dancing prior to the ceremony and long into the night. If you think people won't bundle up to watch your first kiss or dance along side you late into the evening on a cold day, you'd be wrong. I was so pumped to photograph this wedding after Amber & Ryan met me last year. We laughed about the fun we could have with penguins and the views from the rooftop of 21C Museum Louisville. They were so fun and easy going, I knew I'd get much needed creative liberties with them during our portrait sessions. 21C did not disappoint. But even more impressive is the event Amber and Ryan planned for their guests. They created their own piece of art during their ceremony in front of their guests. They even true some paint around, Amber got some on her dress and she loved how appropriate that made their wedding. (side note: Amber and Ryan met in art class!) They also had their reception, toasts, dances in the gorgeous atrium at 21C Museum. Their guests enjoyed roaming from gallery to gallery admiring the art and ambience of the venue. It was a real treat to follow these guys around and I am forever grateful for the opportunity to know them. Tucked away in the middle of Louisville, Trent & Trang married in the afternoon at Garden Court. They shared both Vietnamese and American wedding traditions throughout the day. The weather was perfect, the venue was magical, and Trent & Trang were smiling all day. Not to mention they practically glowed throughout their wedding day. It was a pleasure to join them and a pleasure to join their selected vendors, including White Owl Weddings. Check out our "Lets Book" Page for more info on our current projects with White Owl Weddings! I met Alli & Curt at Crank & Boom in Lexington for their consultation. We talked about their wedding plans in the Red River Gorge, and possible engagement session ideas. They were both nervous to be in front of the camera and were skeptical that they could look natural. I hear this a lot so I comforted them with stories of my laid back nature and seamless workflow the best I could. Well, then their engagement session came and they blew me away. They were so sweet and intimate, with the most radiant nervous smiles. They were most comfortable holding hands and glancing at one another with quick giggles. It was at their engagement session in a lesser known secluded park in lexington that we all learned their wedding day and wedding day portraits were going to be a breeze. (I'm really bad at keeping my blogging up to date so I will try to share that next.) Here are their photos from what was a smashing success of an outdoorsy, nature filled, and fun filled wedding celebration by two people who tried to tell me they weren't good at having their picture taken! Melanie and Aaron came all the way from Wisconsin to celebrate their wedding with friends and family at Buffalo Trace Distillery. They picked a sunny but cool Friday evening, with the portraits in the gardens and a sunset portrait rendezvous among the barrel houses and smoke stacks. It was delightful meeting their lovely family and getting to photograph the cutest little twins. Thank you Melanie and Aaron for having us, for letting us follow you around your beautiful venue and being such wonderful subjects for us to photograph. I think I was the one to pressure them into rescheduling this session. We originally picked a Friday and it was not only rainy but so cold! Now I'm normally all about embracing the weather conditions, getting creative inside or packing an umbrella. But the more I thought about 40-50 degrees in the rain, the more I feared sickness. Fortunately Aliqae & Andrew were also willing to wait out the very rainy weekend until their last day in town. Then the sun came out, and we frolicked in St. James Court, in Old Louisville. It was such a pleasure meeting these two. So excited for their elegant wedding plans to come to fruition in July. Steffanie & Cody booked us from Washington D.C. 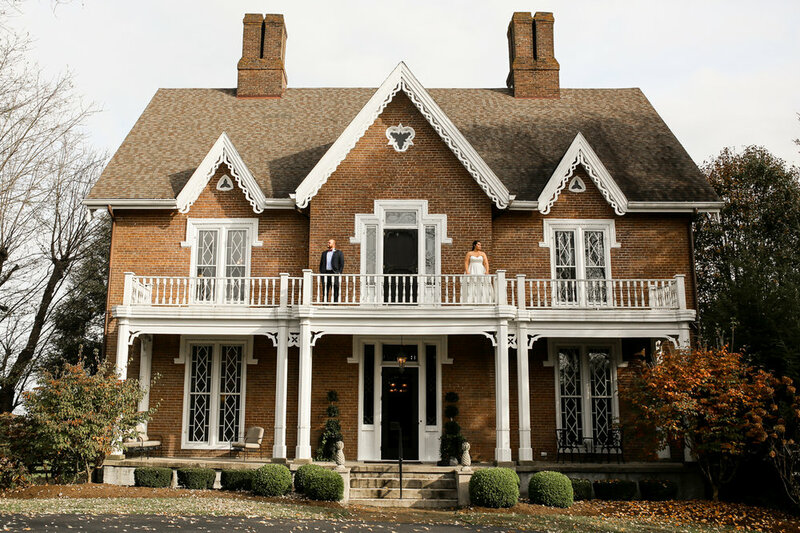 They picked the lovely bluegrass of Kentucky and the gorgeous venue of Spindletop to celebrate their union. We didn't get to meet them before the wedding, which always makes us a little nervous. And to add to it, when I skyped with Stephanie, we actually went through blogs on my website image by image, asking about lighting, technique, editing and styling choices, and I even sent her a few raw files to show the before and after. Essentially, she made me feel very honored to be chosen by her, because I could tell she really cared about her images and her photographer. That all being said, She could not have been more of a pleasure, more chill, or more accommodating. She had put so much effort into creating a fantastic event, and everything was flawless. We also had the pleasure of working along side a great DJ and a great videography team White Owl Weddings. Enjoy the smiles, the intimate moments, and the party that was Steffanie & Cody's Wedding Day. Oh my, oh my. Molly and Michael have a presence about them, that makes you want to re-evaluate your priorities, to look to those you love, and kiss them on the mouth. The aura they have around their selves, seeps affection and intimacy. Michael took every, EVERY chance he had to kiss his bride. He held her close as often as he could. When he glanced at her, a smile would spread across his face. Ah my heart melted over and over again this day. They were beautiful, their friends and family were loving and fun. The weather was kind to us, and they got married in the same cathedral Molly's Grandmother married in. Enjoy friends, and Treat Yo' Self. I was fortunate enough to meet these two on the edge of the West Coast in a charming area called Half Moon Bay. We walked along cliffsides, through majestic forests and down along the foggy ocean tide. Being there was other-worldly. I'm so thankful I had a new change of environment to get my photography juices flowing. It is of course, a great plus that Katie & Taylor were so adorable, adventurous and accommodating. Renee & Cody met me super early for their engagement session to wander through the woods, watch the deer, and then hang amongst the murals in the distillery district of Lexington. I was so excited for their wedding after I became so taken by these two. Renee made her own Moss Boxes with wood from her Parents house. They are so impressive! Renee also forewarned me that she had an epic wedding gift for Cody. That was just the Cherry on top. I won't ruin the surprise, you'll have to check out the photos below to see what her gift was. Thank you to Renee & Cody for being gracious and accommodating throughout the day. They had the most contagiously high spirits and it makes our hearts so warm. This wedding was such an adventure. Larissa got ready at a gorgeous farm, met Casey under a shade tree. They got married along the Lost River under a patch of gorgeous trees. They wrapped up their celebration in the cave! We arrived for Laura & Anthony's wedding day at a gorgeous Airbnb in downtown Louisville. The hosts were so gracious and accommodating. Laura got into her stunning 2 piece gown and met her husband to be in the front yard. We loved roaming around the property for portraits. We then headed downtown to the BBC Bourbon Barrel Loft where an intimate and tear filled ceremony started off a night of dancing, smiling and celebrating Laura & Anthony. The food was delicious, the BBC Loft was great hosts and we adored each and every time these two lovebirds hit the dance floor. We knew they were making the move to Conneticut after their wedding so it was a bitter sweet good bye to Kentucky. I think Kentucky will miss them, but we know these two have all the love they need to make Connecticut just as wonderful. We have never been so wet. Despite a great big old Osage tree, Jessica & Clint got soaked for their first look. They were such good sports and didn't let the rain damper any spirits. They read rain spotted letters before finally seeing each other, and then we did our best to avoid the rain. Alas, we embraced the rainfall and found a great "village" to wrap up our portraits. Then we got to see the beautiful space that is Terrapin Hill. The ethereal woodland Chapel stage where Jessica & Clint would marry, the open reception area, the bomb fires, the live music and the craft pizza made for a great night to be apart of. Even though our sunset portraits were overcast, and our lanterns were dappled in rain, every moment was full of rich tones, laughter and love. We would do this wet cold day over and over again. I need to warn you as to what you're about to see. You're about to see some dainty shoes, and glamorous dresses on some women who did some push ups while drinking mimosas. You're about to see lots of wonderful people come from a very far distance to see one particularly beautiful mimosa drinking, push-up mastering woman with #weddingarms we could all envy, marry the sweetest, handsomest gentleman who can dance and sing backstreet boys and put you to shame. You're gonna see a dance floor that gave us a first time applause for our side dancing that only few notice. You're gonna see the most wondrous collection of trinkets and treasure, expertly designed by Tweed & Tin, and most elegantly complimenting a treasure of personality by those surrounding Jessica & Greg. You're gonna see the coolest Photo Booth, a flowery sunset, some grungy buildings, lots of bourbon and a Hawaiian hog roast. Last but not least, you're gonna see atleast a million smiles. We never know what to expect when couples opt to not do engagement photos. But Katie and Evan were full of good surprises. They were classy and fun. They could strike a GQ pose and then laugh a full body laugh. Their affection and intimacy was contagious and we swooned over their first dance, Evan's many performances and even their Game of Thrones groom's cake. We loved listening to Evan sing Adam Sandler's "I wanna grow old with you" to Katie and will eagerly wait for that to be topped. Hannah has been a friend since Middle School. She introduced me to Blink 182, tattoos and not worrying about what kind of person, others thought I should be. She's been such as strong influence in my life, for the best. We may not have stayed close, but we've always picked up where we left off. It goes with out saying we met at Rooster Brewery for the engagement. In part to make catching up our first priority, (and maybe for a little liquid courage.) In fact, the hanging out lasted a little longer than I intended and I completely missed the golden hour I was aiming for. When we started the portraits, it was basically dusk in downtown Paris and turned to nighttime before we knew it.